How can I display frequently traveled routes? I think this has been asked before in a question I am unable to relocate which was about how to display multiple overlapping routes on a map, so that frequently traveled routes (with many overlaps) are bright, and single routes are dim. I believe they were trying to re-create an effect from a map they had found elsewhere, and there was an image of that map included in the question. The answer used transparency and blending modes to create a beautiful effect, where overlapping lines appeared to glow. 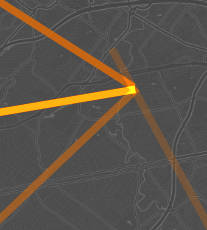 The solution looked something like this, except that the lines followed roads in the basemap. They may also have been categorized with a red-yellow-green color scheme. The basemap in the solution (and possibly also in the question) was a dark grayscale map, similar to ESRI Gray (dark) or CartoDB Dark Matter. The discussion on Creating polyline-based “heatmap” from GPS tracks? has approaches based on GeoTools/GeoServer, Mapbox/TileMill, umap, QGIS, ArcGIS, and other technologies. Not the answer you're looking for? Browse other questions tagged qgis overlapping-features route or ask your own question. Creating polyline-based “heatmap” from GPS tracks? Prefer Straight Routes for wayfinding?